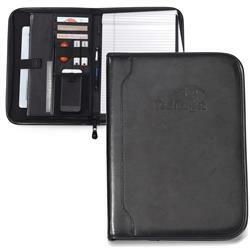 A stylish leather padfolio that will hold all your tech including iPads or tablets with your custom logo. Classic styling with a zippered closure. Interior scratch-resistant tablet pocket with Velcro closure (fits all tablets.) Multi-function organizer with mesh smartphone pocket. Unique FlipTuck feature for storing paper behind writing pad while taking notes. 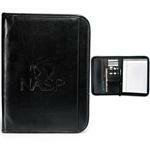 Includes 8 ½" x 11" paper pad and a pen or stylus loop. A new addition to our custom e-padfolio line. Production Times Available: 5 working days standard. FREE ONE DAY RUSH PRODUCTION! Available Imprint Options: Deboss, Print or Personalized.